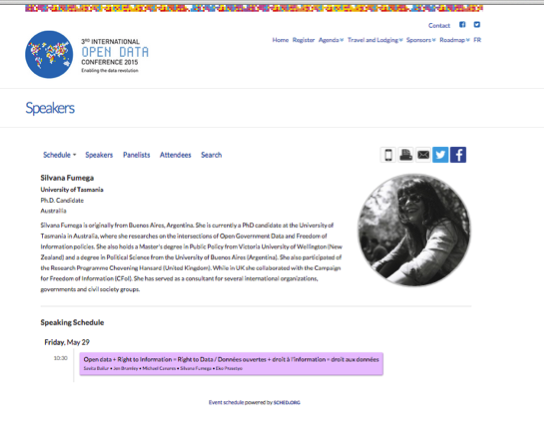 This week I’m scheduled to participate in the 3rd International Open Data Conference (and satellites events such as the unconference and the @ODRnetwork Research Symposium). As I thought I wasn’t going to make until the last minute (I’m currently based in Australia I need to deal with one of the longest visa processing times in the world) I started to write a few words a few days ago (before getting my passport back and taking the numerous planes to get to Ottawa) as I wanted to share my two cents on “my topic” for this #IODC week: the relationship between Freedom of Information (FOI/RTI/ATI1) and Open Government Data (OGD and not Open Data in general as the concept is too broad). I have been thinking (mostly), talking (sometimes here and here, among other recent events) and writing (a bit less, in this blog and others or by including some points on other types of work) about the relationship between those two concepts as well as the movements (specially in terms of the actors working in these fields) for quite some time now. My concern (almost an obsession now…) started in 2009 when I decided to start researching on the convergence between these ideas. Open Government Data was not as popular as it is today but there were already several initiatives around the world based on the proactive disclosure of government-held data in reusable formats. - Why OGD and FOI? We can all agree that convergences of ICT developments, the diffusion of Freedom of Information (FOI) laws, public sector embrace of ideas like e-democracy and e-government, have been significant features of the last decade. Not only that but ICT developments have contributed to the changes on the government information environment. In that sense, the concept of accessing governmental information has been extended to cover the idea of having access not only to information but also raw digital data, known as Open Government Data (OGD). However, the requirement that information be presented in reusable formats is relatively alien to FOI legislation (even within the FOI 2.0 reforms2), with some exceptions3. This absence in FOI legislations presents some correlation with the lack of overlapping academic literature but also in the lack of connection or interaction between the actors (Darbishire 2010; Hodges, 2011; Fumega 2010), who work in these complementary fields4. In this context, OGD became more and more popular and many practitioners started to use FOI and OGD as synonymous (thinking that the only difference between them was a computer) or to diminish the FOI movement as a thing from the past. These 2 points are not correct but they are not entirely incorrect either. This is the starting point for this long (sorry) post and also, in a way, for my thesis (and different PPTs for this week). In the first place, the differences between both approaches (FOI and OGD) in terms of government information and data relate to the strong correlation between the information environment and the initiatives arising from within that environment. Stiglitz’s concept of information asymmetry can be applied to explaining some important differences between FOI and OGD, as they were introduced into environments with different levels of information asymmetry. (Stiglitz 1999) In general, government secrecy was considered a natural operating norm before FOI reforms. Nowadays, secrecy has to be justified. (Fumega 2013) However, this is not the only difference between these two movements5. However, this is not the only difference between these 2 fields (the divergences go beyond the time in which these two fields were developed). 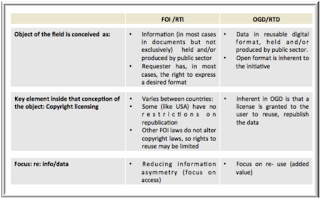 Thus, even though both fields are intrinsically related there are some important points that separate FOI from OGD. Some of those divergences relate to the object of study in each field, the focus of the initiatives and the role that licensing play in the reuse of the data and information. • Object: Even though the FOI/RTI movement advocates for greater access to government information, and by definition their work should include inert and adaptable data (if data is the raw element to produce a meaningful output known as information, adaptable and inert data should be both the object of FOI advocacy campaigns), in practice, their work is mostly focused on access to inert data (or information) for transparency purposes. • Tied to that first point is the main focus, in terms of the information and data, behind the initiatives. In the case of FOI legislation, the principle behind it is to reduce information asymmetry (focus on access). Thus, they do not generally give the requester any right to re-use information (users just have a qualified right of access and the right to request, in some cases, for a particular format). In the case of OGD the possibility to reuse (added value) is inherent to the field and therefore, as above-mentioned, the format in which the information is presented is part of the very own definition of the field. • This focus on the reuse in the OGD field, it has a correlation on the other point that is the importance of copyright/licensing. In that sense, in many countries around the world, FOIAs present no restrictions on republication (in other countries where the FOI laws do not alter copyright law, the reuse may be limited). In OGD is inherent as a license is granted to the user to re-use, re-publish the data, if not there is not such OGD movement and/or initiative. Taking into account these brief recount of some of the main differences between these two fields, we also need to think about the advocates in both fields. Why is that? The main reason is that the prior efforts of domestic and international NGOs and individual advocates laid the legal and administrative foundation for access to government information (and later, data in digital format, with the influence of ICT developments) and sowed the concept that government information should be prima facie available for access. Not only that but also most of us have heard different actors advocating for a Right to Data6 in the past few years but we have also read and heard about the gap between the RTI and the OGD communities7. What are the main characteristics of these two communities and also their points of divergence? As a matter of generalization (as there is no one model which fits them all), FOI community has been mainly focused on the access while OGD groups are also dedicated to the reuse of the disclosed data8. These differences, which are supported by the philosophical background behind both fields, also explain the diverse approaches to their relationship with governments. Even though OGD organizations promote a similar set of western liberal values than those supported by FOI organizations. However, they present some differences (in the case of OGD due to the importance of the hackers ethics in the community and therefore the initiatives as well). Thus, the hackers’ ethic is a key component of the philosophy that most of these organizations include in their missions and visions as well as they promote in each of their activities. They, in that sense, present a more collective spirit, and discourse based on the ideas of efficiency and innovation. After this overview of both fields (OGD and FOI) and their advocates, I would like to go back to the idea of Right to Data and Right to Information. Taking all the above-mentioned elements into account, it is clear that RTD is not just the same as the RTI field in a context of Internet massification or, as previously said, “RTI+ a computer”. To sum up all the points in this long post, advocating for a right to data is much more than just the access to the data. It involves primarily the possibility of reuse as the value added to the data (towards a vast set of different goals) and, therefore, it is much more than an article on the current RTI legislation. To be effective a regulation on the right to data needs to address not only the access (sometimes already covered by RTI legislation) but also most importantly on lifting the barriers for reuse (copyright, licenses, formats). 1- In this particular context, I use FOI, ATI and RTI as interchangeable terms. 4- This statement is not only based on the review of academic literature but also on personal observations. 5- Here the term “movement” is used in a loose fashion to define as a group of individual and organizations advocating for a similar cause. 7- In the Latin American Open Data Conference we had also sessions on this very topic.